« Are SMART goals stupid? We make first impressions and long-term judgments based on the smallest of clues. We scan before we dive in, we see the surface before we experience the substance. It could be your business model, your haircut or the vibrato on your guitar. “What does this remind you of” opens the door for useful conversations that you can actually do something about. Yes, be original, but no, it’s not helpful to be so original that we have no idea what you’re doing. —Seth Godin, What does this remind you of? Seth is talking about getting feedback; we’re interested in being creative so let’s flip the focus. The word “remind” is the key; how do we re–mind ourselves to come up with something new? It turns out that guided visualization (aka guided imagery) is one of the most powerful modalities for tapping our creative and unconscious wisdom. A wide variety of visualization techniques exist and they can be customized to provide creative insights into specific challenges — like event design. Surprisingly, there are few resources available on how to sculpt guided visualizations for exploration of a specific creative challenge. Most books and posts describe how to use guided visualizations for meditation, health, mental state change, and artistic creativity. Once you’re familiar with the basic principles, however, it’s not hard to adapt these methods for creative event design. So here are three ways to use guided visualizations to take a fresh look at an existing event or create a vision for a new one. 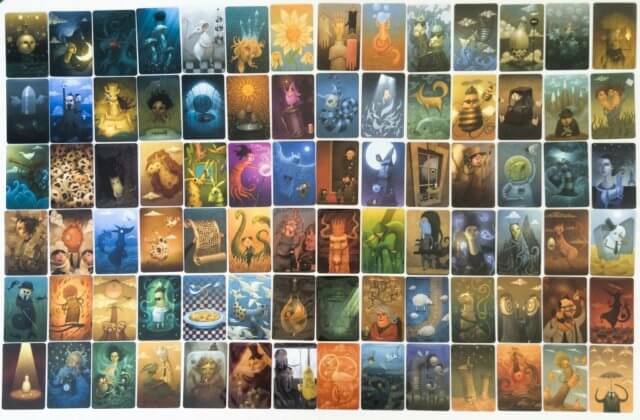 One technique I’ve used is to display to clients a large number of the fantastical cards (sample shown above) from the popular game Dixit and ask them to pick a few that speak to them in some way about their current event and a few that say something about what they would like the event to become. I encourage people to pick cards without trying to analyze the attraction. We then look at the chosen cards in more detail and explore and uncover what the chosen cards reveal about the current and future potential of the event. Invariably, my clients discover powerful and enlightening perspectives and objectives they weren’t aware of: fertile beginnings for a fresh and relevant design. My colleagues Eric de Groot & Mike van der Vijver use another guided visualization approach: they ask a meeting owner to think of the meeting content as some kind of material and describe the “motion” of the meeting content. Clients draw pictures of their answers, which can then be mined for insights. A variant is to ask clients their answer to the question: “If your event had a mouth what would it say?” I’ve used this approach as well and highly recommend it. Alternatively, an event designer can guide clients on a journey to and through the event in their mind. You can adapt scripts like this one to your needs. Replace traveling to a private garden with a journey to the event venue (if it’s already known and familiar) or an ideal venue that appears in your mind as you walk along the path. Guide your clients through the venue where your future event is in full swing and ask questions. If you are working with a single client, they can answer aloud, which may spark clarifying questions. Multiple clients on the journey mentally note their answers. What does it look like? What does it sound like? Who is there as you enter the lobby? The meeting rooms? The social areas? What are they doing? How are you feeling? How are the attendees feeling? What are you experiencing that isn’t in your current event? What else are you noticing during your journey? When the guided journey is over, lead a retrospective to discuss what the clients experienced and learned. In my experience there will be at least one key insight on how to create or improve the event. Besides the power of these techniques to discover great new creative design ideas for an event, another big benefit is that they generate persuasive client buy-in for the ultimate meeting design. Why? Because the clients “dream up” the ideas themselves! Anything that eases the adoption of a fresh approach to event design makes my (and your) job easier. This entry was posted on Monday, April 30th, 2018 at 6:35 am	and is filed under Event design. You can follow any responses to this entry through the RSS 2.0 feed.You can leave a response, or trackback from your own site.